I swear, I am thinking of all of you. Anyone want to guess where this beach is? If you’ve been to this place, you’ve seen this tree. No, I don’t have access to my blog. Yes, I am using my sunscreen. And, yes, someone with a very big gun and an enormous pit bull is watching my house. What’s the best vacation you ever took? Where’d you go and what made it so great? This entry was posted in Travel and tagged Islands, Travel and Tourism, vacation, Where am I?. Bookmark the permalink. I don’t know where you are, but wow, it looks amazing. Enjoy your vacation! Ahhh, yay for Renee! It sounds wonderful. Although I am putting up all of the best posts I’ve ever written this week and you’re going to miss them all (heh heh, as if). I think my favorite vacation was going to Australia for my honeymoon (never wanted to come back! ), but going to Cancun with my future hub when I was 23 was pretty great, because I’d never done ANYTHING like it before. It was the first all-inclusive resort I’d stayed in, and I just couldn’t get over all the perks. It was a really nice hotel, not remotely crowded, and the weather was perfect. It was definitely that I-want-to-run-and-jump-on-the-bed type of glee. How pretty! 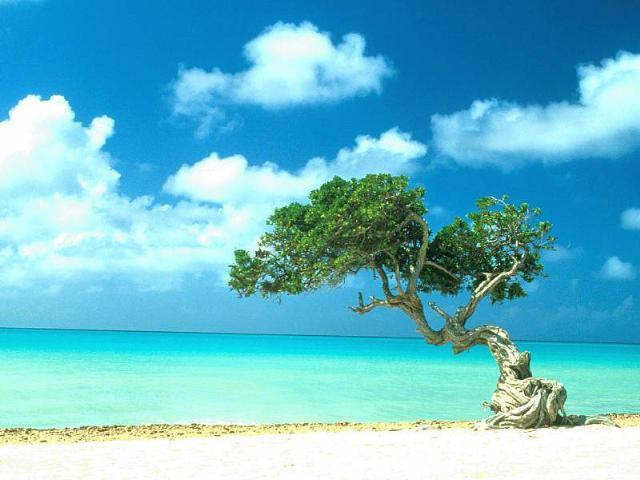 Looks like Eagle Beach, Aruba. Gorgeous picture. I wish I could be there! JEALOUS!!! Enjoy every little, tiny, millisecond of it!! Also…I hear you’re reading a good book…. I shared my favorite vacation in a recent post, so I’ll share another—tooling around Paris by myself. Company was sending me to an industry meeting at a five star hotel. I took my wife. Since the company was paying for the hotel room, our only cost was her ticket, and food. Yeah, it was a working vacation, but no kids, some great adult conversation, and the organizers found out ahead of time that she was a musician, and she ended up being part of the entertainment! Ooh. Take me, take me. It looks like Aruba but not sure. Best vacation – anytime there’s sun, fun, and someone else doing cooking/cleaning! Love this photo. Love that you have unplugged. And loved thinking about the 3 1/2 weeks I spent in Italy and the Greek Isles with my husband, where we happened to pick up my favorite souvenir of all our vacations: my daughter. 🙂 Enjoy your time off! I know that photo – easy. Shore Elizabeth New Jersey, Newark. right ? The colour of that water? That’s my favourite colour. And lime green. The colour of spring foliage. Or so I’m told. We had a dump of snow on Wednesday. My favorite was Maui! I also loved St. Thomas (honeymoon) and Aruba! Have fun Renee! Um – fantasy island sounds good to me! Do they have margaritas? Enjoy your vacation! Hey darling. Best vacation was our honeymoon — San Fran and Monterey — and we returned same place 5 years later. We made love on top of a cliff overlooking the Pacific Ocean. In the fog and the rain. So romantic. And we hiked 10 miles a day (yep I married a guy who can keep up with me!)! I hope you and Hubby are well!! Miss you. xoxo. We’ve been to Florida several times. The serenity of the beach is awesome. I especially sitting and listening to the ocean at night. Have fun! We’re stuck here. With matzah. It kind of looks like a tree taken from the savannah of Africa and stuck somewhere in the Caribbean. Or something. But wherever it it, I want to be there! Enjoy! If you’re on that beach you’d definitely not be thinking of us, dearie. ha! you’d better just be thinking about havin’ yo’self a fun time! =) Hope the writing and relaxing is GREAT! My favorite vacation is going up to the family house in the Adirondacks of New York. Sure it’s crowded, loud, and we’re super busy cramming in tons of activities, but it feels like coming home. You know that feeling when you check into a hotel and you don’t know where anything is? We never have that feeling. We know exactly where everything is, what needs to be done, and that we can just relax. That’s the key. We can relax. There are no worries. The kids can go off and do their own thing, while we sit on the boat or on the beach. All I can say is…ENJOY!! Wait, what? I didn’t comment on this stunning photo? I did. I did comment on this stunning photo. Holy canoli. What happened to my comment. I had stuff to say. About the tree. And the ocean. And sand. And you enjoying it all. I hope you enjoyed it all. Sometime, I’ll tell you about my best vacation ever. But let’s do it in person. So I need to sleep. We need to cross over. I KNOW you hate the phone.